ChurchMag / Web / Blogging / Going Pro with Your Blog Design? Going Pro with Your Blog Design? 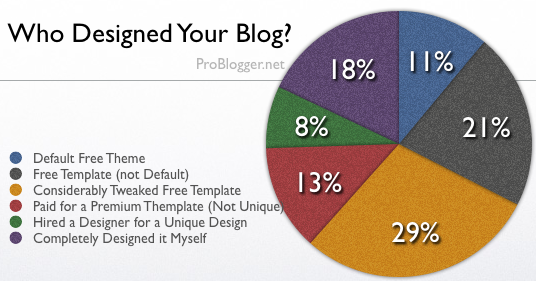 A great poll that was taken over at ProBlogger.net covering blog design has posted the above results. I think it’s telling for a number of reasons, although I’m a bit skeptical about the 18% that completely designed it themselves (that seems a lot). One thing is for sure though: The most popular, “successful,” and “pro” blogs out there have a unique look. The question, of course, is how one knows whether they have reached critical mass to warrant a unique look and feel? Some would argue that you have to “dress for the job that you want” type mentality when it comes to blog design. Others would suggest prudence and a proven track-record before making the jump. Where do you sit? As I recall it, Stuff Christians Like remains completely standard, and Seth Godin's is pretty laid back. I think it helps Godin, but I think SCL should redesign. I'm on the fence regarding your question, "how one knows whether they have reached critical mass to warrant a unique look and feel". I don't know that it is either of the options that you presented. like stephenbateman said… Seth Godin's blog is pretty simple/standard, but extremely successful. I think that it depends more on what you are trying to offer than whether you want (or have) a certain level of success. From what I've seen in blogging… content is king. This is why simple blogs like Godin's are so successful. good point dan, love it. content is important, but the delivery of it is equally important in many situations. your content could be amazing, but it could be presented (visually) terribly that you'd never know it. I average about 20 page views a day, I think it's okay if I stick with default themes. I just made the switch to going from free theme, to purchased theme with a little tweaking myself on the css. I honestly would to having someone like yourself design me a unique theme (who wouldn't want that) but I don't have the money to do that. I am hoping down the road that my blog traffic and resources that I list on my blog/website resource page warrants a unique and custom design, but who knows. take it in steps… good for you! Yeah, I'm using a theme that I customized just a tad, but it's still pretty stock. I'm fairly happy with it at the moment, actually. Think it feels clean and simple, and I'm trying to write quality content. Eventually I'll move over to wordpress and one of your themes!! Hopefully it won't be too long. i'm still in learning mode through all of this. i did purchase a theme and modify it recently. but there are a lot of factors to consider when designing or re-designing and a lot of questions that should be answered.